April | 2014 | tales of an INTJ school librarian. tales of an INTJ school librarian. Who Am I? What Am I Blathering On About? I have no idea how long this post will take me to write. In fact, I have every intention of freewriting and editing later – if I feel inspired to try to sound ‘well-written’. The thing is, I haven’t blogged since…oh. Since my first week of full employment as a #tlelem. I suppose that leaves my year so far open to interpretation – is it going so well that I’m spending all of my free time engaged in other job-related activities? Is it so unlike what I expected that I can’t bring myself to discuss it publicly? Honestly, it is neither of those two extremes. This post isn’t meant to serve as an explanation of where I’ve been. In the spirit of #whylib… this post is meant to serve as an explanation of why I am where I am and why I do what I do, with perhaps a glimpse to the future. 2005-2006: worked in high school library as an elective course for 2 years. Also fell in love with chemistry. 2007: Went to the local university as a chem major. Spent a year immersed in botany, two more chemistry classes (which were, to be honest, easier than my high school classes), and two semesters of serious calculus. Then, in May ’08, switched my major to… history. 2008-2011: took history, accounting, finance, and English literature classes. Because liberal arts. 2011, May: Finished undergrad, went to Syracuse University for my MLIS-school media on a scholarship. 2013, May: graduated from SU. 2013, August: started my first elementary/middle LMS job here in Virginia. grouchy. unhelpful. boring. rude. annoyed by the mere presence of a human being. So when I decided, “hey, I want to be a school librarian”, I also took with me the idea of “and I don’t want to be anything like the school librarians I’ve known.” Fortunately, I met great folks during my two years in Syracuse – folks who were fun – engaging – who enjoyed their job – who liked being around children – who wanted to be helpful even if it meant going above or beyond the most basic of responsibilities. Basically, I found people like me. People who wanted to do this, and after 5, or 10, or 20 some years, still wanted to do it. Thank you for being the ones I turn to when I’m having a competency crisis – I know I can because you’ve shown me that I can. I wanted to take my experience and do whatever was in my power to give students an experience unlike my own. What does it look like in reality? This is what it looks like in reality. In photo form! My students might leave my class slightly late with a pass, because I don’t want them to leave feeling unsatisfied or beyond help (or maybe I just really want to hear what they have to say, but there wasn’t an appropriate time for it during class). There might be a surprise delivery to a classroom of a book that a student really wanted but I couldn’t locate on the shelf in the time they had. I walk up to individuals in the hall to ask questions or throw out ideas. When I see my students in the hallway during morning duty, I say hello and greet them. I hand out bookmarks like they’re tickets to another world, even if I know a student has a half-dozen in their desk already, and I write their names on them with a note from me because I can. I email back. Some days it’s a challenge to keep a smile on my face, but some days my students manage to bring it back. Some days I have to call parents because their child can’t get it together, and that’s disappointing. But some days, a student who could drive you batty nine times out of ten comes up with an incredibly insightful comment on the project – and you can’t help but feel overwhelmed with joy. Where am I going from here? I’m relocating at the conclusion of this school year, so my students this year will not be my students next year. I’m trying not to let that get me down, but rather embracing the time we have left together and trying new things – things that some might find out-of-the-box while others find them simplistic. I believe in my students and want to see just what they can accomplish this year. I want them to know that even though I won’t be here next year, they can still explore and be inquisitive and find answers and ask for help. I want them to feel safe in the learning environment, even if I’m not part of that environment. I hope that’s the case. I hope I have another learning environment to work in next school year. I’m applying and sending in documentation and doing what I can to make that the new reality. If it doesn’t happen, I’ll find some other sort to way to make a difference. I’ll take with me the many things I’ve learning during this first year as a TL, and I’ll take the encouragement I’ve been given as well. I’ll leave you with this line, which comes from my most recent evaluation – it’s just a few short words, but it made my heart sing because it’s working and now I know, I can do this. My name is Marie. 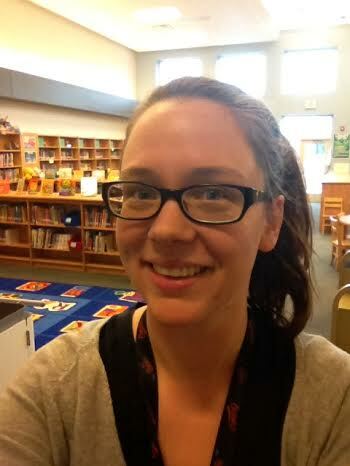 I'm a teacher librarian; I studied at the iSchool of Syracuse University. My blog is a safe space for reflective practice through the art/science of journaling, free writing, and idea creation. Constructive feedback is ALWAYS welcome and is encouraged. We become better through sharing what works, learning from what isn't nearly as successful as we hoped, and being willing to take risks. Thanks for joining me on the journey to Rockstar Status.